Decorative brackets and a wide porch bring inviting curb appeal to this stylish home. The open kitchen serves both a large great room and a single dining area with bay window. 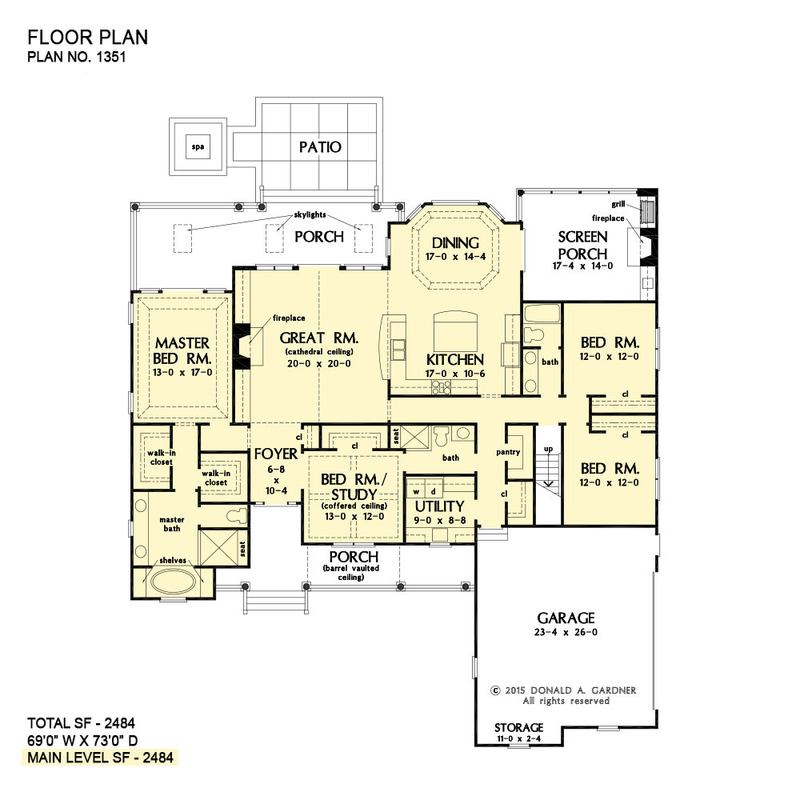 A secluded master suite is set apart from two secondary bedrooms and a bedroom/study. Livability extends outdoors with large porches on both the front and rear and a screen porch with fireplace and outdoor kitchen. 1st Floor: 2484 Sq. Ft. 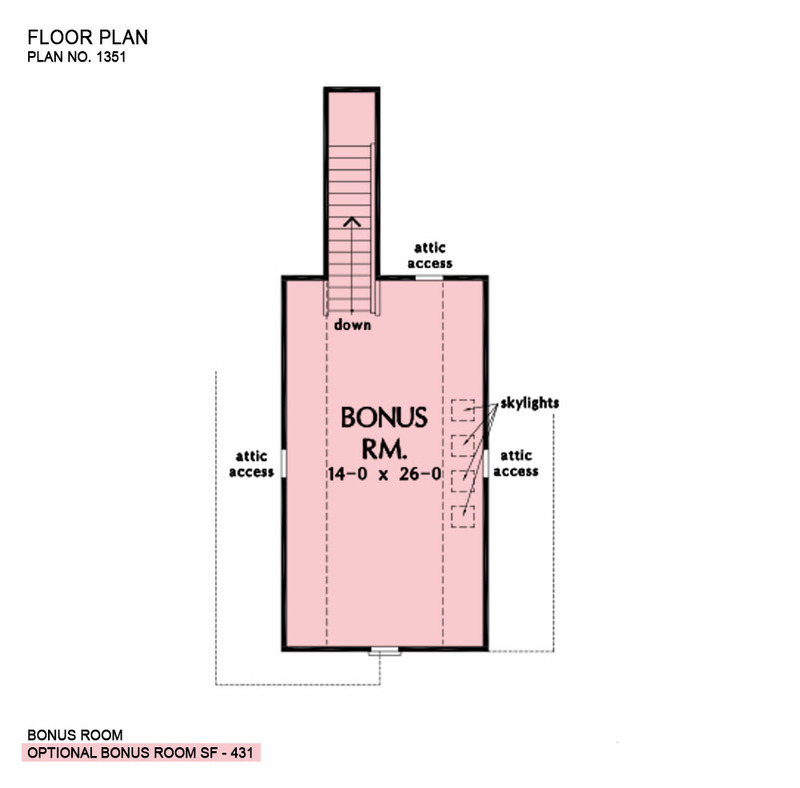 Bonus Room: 431 Sq. Ft.
Porch - Front: 225 Sq. 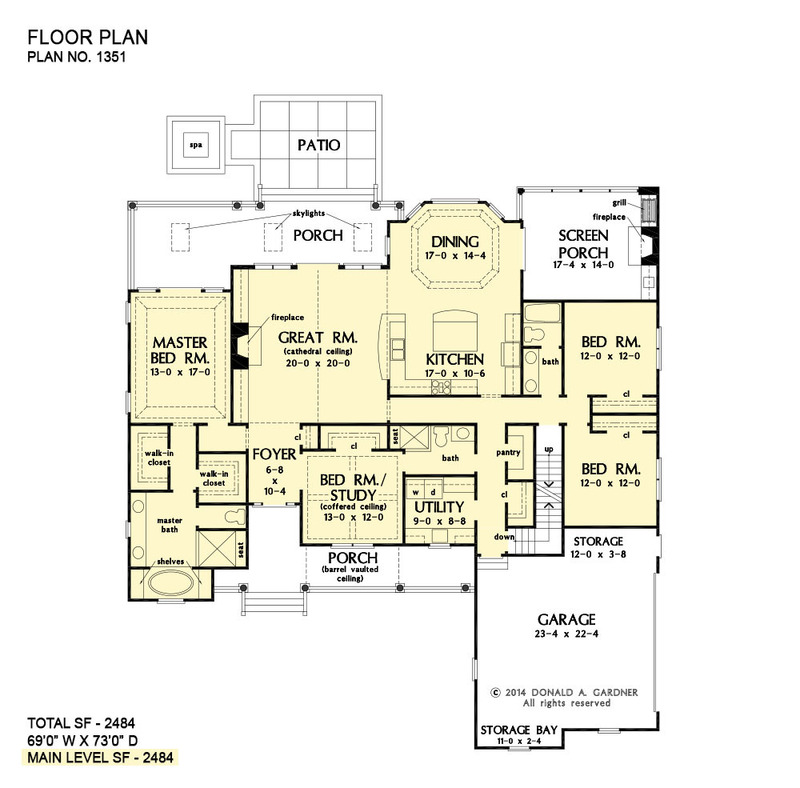 Ft.
Porch - Rear: 328 Sq. Ft.
House Dimensions: 69' 0" x 73' 0"
Foyer (Flat): 6' 8" x 10' 4" x 9' 0"
Dining Room (Tray): 17' 0" x 14' 4" x 9' 10"
Great Room (Cathedral): 20' 0" x 20' 0" x 22' 7"
Kitchen (Flat): 17' 0" x 10' 6" x 9' 0"
Utility Room (Flat): 9' 0" x 8' 8" x 9' 0"
Bonus Room (Clipped): 14' 0" x 26' 0" x 8' 0"
Garage (Flat): 23' 4" x 26' 0" x 0' 0"
Garage Storage (Flat): 11' 0" x 2' 4" x 0' 0"
Bedroom / Study (Coffered): 13' 0" x 12' 0" x 9' 10"
Porch - Front (Flat): 29' 4" x 6' 0" x 9' 7"
Porch - Rear (Flat): 33' 8" x 8' 4" x 9' 0"
Deck / Patio (None): 16' 8" x 13' 9" x 0' 0"
Porch - Screen (Flat): 17' 4" x 14' 0" x 9' 0"